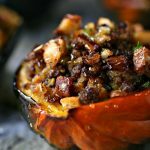 This Maple Roasted Acorn Squash with Bacon is a quick and easy recipe that is perfect for fall. Perfect for every day or holidays. 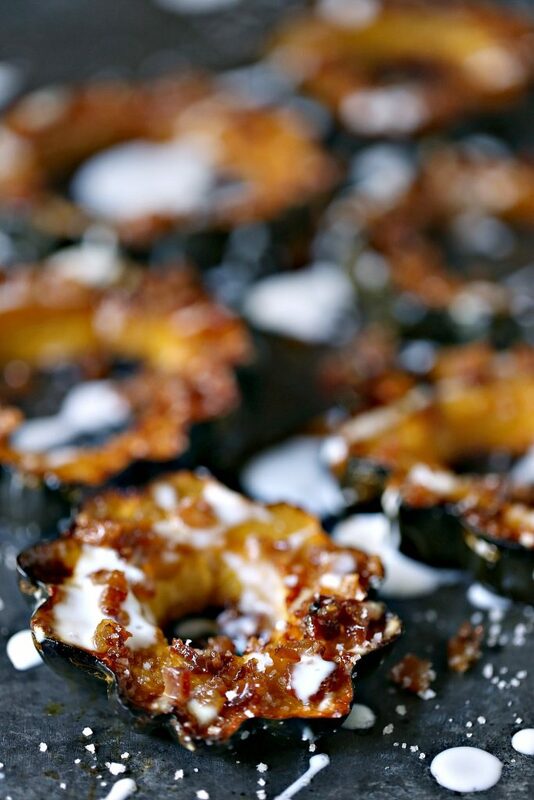 This acorn squash is brushed with butter, brown sugar and maple syrup then roasted to perfection. After it’s cooked it’s drizzled with yogurt, bacon bits, and a dash of salt. This girl does! I always keep tons of it on hand for cooking and baking. I mean nothing gives recipes flavour quite like butter. It’s a classic ingredient for a reason. If I’m being honest, this girl prefers summer. I’m a warm weather kinda gal. I do like fall though. I’m just not fanatical about it like some people. This gal does enjoy fall weather for cooking and baking though. I do enjoy being able to have the oven on all the live long day without sweating to death. I can slather butter on everything and my house stays cool until spring. Not such a bad thing. In fact, it’s quite a great thing. Fall produce rocks. Fall is harvest season. 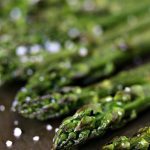 It’s the time of year where farmers markets and farm stands are overflowing with amazing produce. 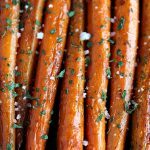 Fall vegetables are perfect for roasting. With butter. Lots of butter! I used Gay Lea Salted Butter for this recipe. Gay Lea is a Canadian dairy company owned by dairy farmers. Pretty cool, am I right? It’s a co-operative. I dig that. Born on the Farm is an idea I can wrap my head around. Wholesome ingredients and quality products make Gay Lea a family favourite. Now is the perfect time to combine dairy with fall produce. Cooler weather calls for long drives through the county and stopping at all the local farm stands. Every year my daughter and I go on long drives on Friday afternoons. We drive to Point Pelee and spend the day hiking and wandering around the point. After we’re done we grab lunch at one of the restaurants by Point Pelee. More often than not, we stop at the one and only food court in the area. Once our bellies are full, we take the long way home as we check out all the local farm stands. Fruit and vegetable stands are huge in our area. Some are small with specific produce they love. Others are massive with loads of variety. Leamington is known for their tomatoes. I swear they have the best in the world. Essex County has an amazing array of produce during fall. We love picking up pumpkins and squash. Acorn squash is my favourite. It’s so easy to prepare and cook. For this recipe I kept things simple. I mixed Gay Lea Salted Butter with brown sugar and maple syrup. I brushed that over the squash and baked it. Easy peasy. Once it was cooked I drizzled vanilla yogurt over top, then tossed some bacon bits over the squash, and sprinkled it with salt. Seriously, so easy! This is a fall favourite. 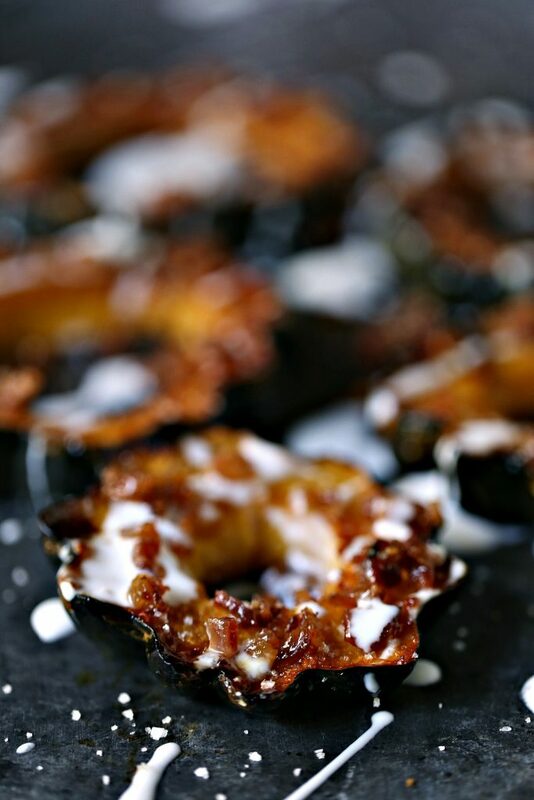 Roasted acorn squash with bacon, it’s delightful and packed with flavour. You need to try this recipe immediately. Preheat oven to 425 degrees F. Line cookie sheet with parchment paper. Set aside. Wash acorn squash. Dry. Cut into slices, removing insides. In a small bowl melt butter in microwave. Add brown sugar and maple syrup. Mix. Brush mixture over both sides of squash slices. Place on cookie sheet. Bake in preheated oven for 15 minutes. Flip slices over and cook for another 10 to 15 minutes, or until perfectly golden brown. Remove from oven. Places slices on platter or serving dish. Drizzle with yogurt, toss bacon bits over top, and sprinkle with salt. Serve with a big old fall loving smile! If you’re looking for more pasta recipes be sure to check out my recipe index. 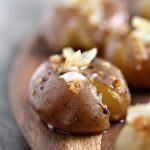 You can also find easy dinner recipes as well. Mmmm you had me at bacon!! Looks so good! Ha, thanks Ashley. I appreciate it. These would be gorgeous on a white platter for Thanksgiving, but I don’t think I can wait that long!! Thanks Liz. It’s so good and would look amazing on white. I have another one coming up with a sweet chili drizzle. Omg, so good. Ha, bacon is the bomb. Thanks so much. I love acorn squash so much! Especially with the bacon! Me too Jennifer. 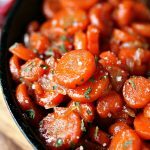 It’s the perfect fall side dish. You can’t go wrong with butter and bacon. I need to give this recipe a try! Ha, I feel that way about everything in life. Everything is better with butter and bacon. Hope you love it. 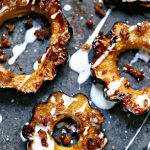 Maple and brown sugar roasted acorn squash is my favorite way to prepare it, but I’ve never tried it with the addition of yogurt and bacon bits – genius! Thanks so much Kimberly. I’m love mixing it up with fun flavours. Bacon is my weakness. This would be such a show-stopper at the Thanksgiving table, but honestly, I want this all autumn long! Thanks so much Liren. I love side dishes. There are such endless opportunities for flavour. The bacon was a novel idea!! Great job!!! This is the perfect side for fall! Will be great for Thanksgiving! Thanks so much Erin. I appreciate it. How lovely. My family is going to love this! Thanks so much Brenda. Hope you get a chance to try it. I love these photos! This is totally the perfect fall weather recipe! Thanks os much Angie. I had fun with this recipe. Some foods just photograph so nicely. My mouth is watering over here! If I could eat this right now it would be breakfast and I would be a very happy camper! 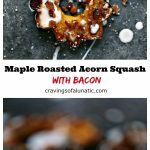 Butter, Bacon, Maple….and squash, Those are some of the best ingredients right there!! Such a gorgeous dish and I can’t wait to make it! Pretty sure that squash has never looked so good! This looks so good, am so looking forward to making this. As a kid I didn’t like veggies but when my Mom made acorn squash I loved it. She cut it in half, slathered with butter in insides of squash, then laid them upside down in baking pan until tender. Been many years since I had that but will be making acorn squash that way then next time your way. See which way Mr.Furry likes it best. 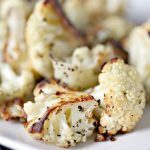 So glad you shared this delicious sounding healthy recipe. 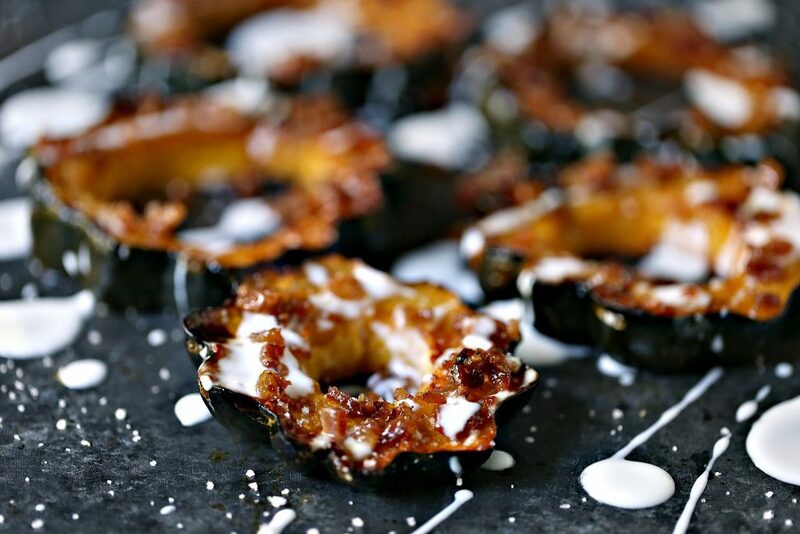 We loved your Acorn Squash recipe so much when you shared it at the #homemattersparty that we are featuring it this week. We hope you will check it out when you have a chance. Swooning over the flavors combo in this dish! 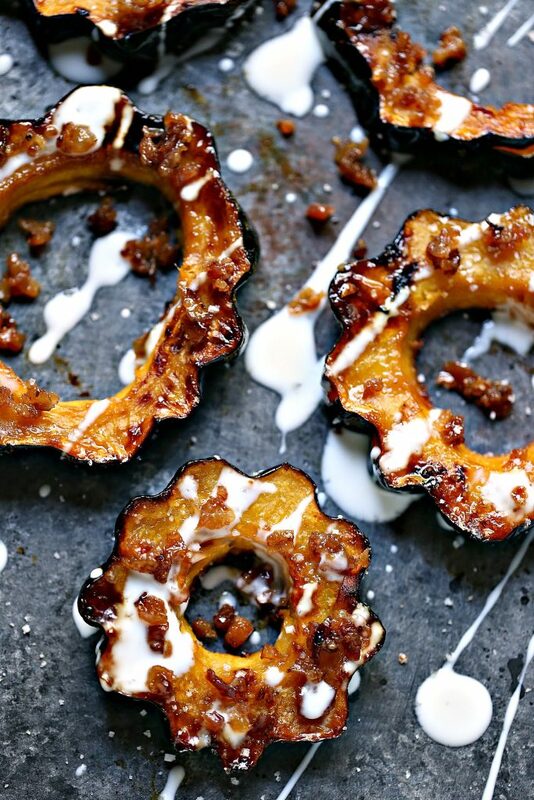 Adding acorn squash to my shopping list because this needs to happen in my kitchen! Thanks, Anna. I am so in love with fall this year. So many options for amazing side dishes. I have 6 different kinds of squash in my fridge for next week. Going on a cooking bender. Ha. 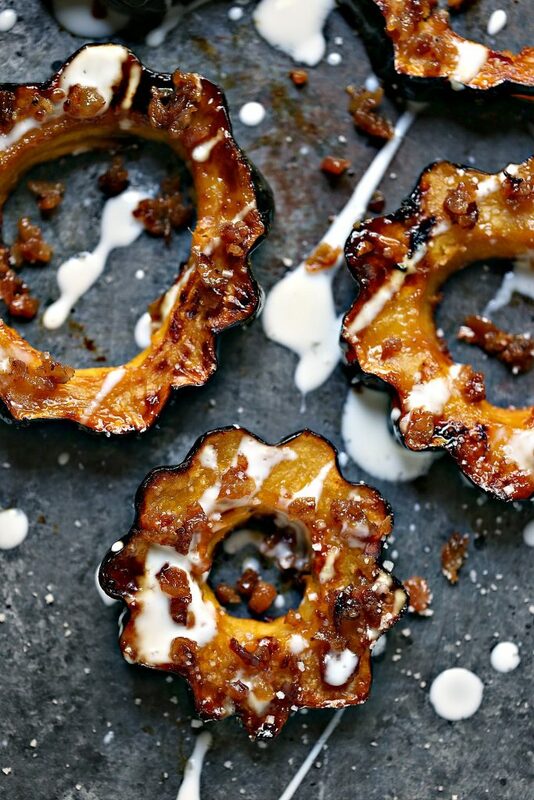 What a beautiful way to dress up acorn squash! Yum! I can’t wait to give this recipe a try. I mean, seriously, OMG! Wish I had that fab butter in South Florida.